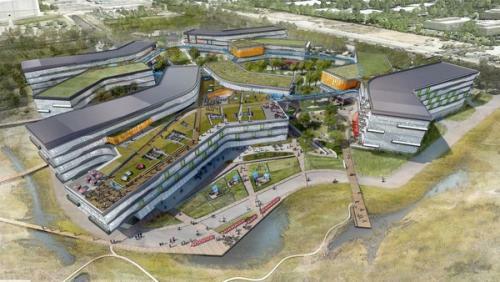 Google’s proposed new campus in Mountain View is running up to one year behind schedule as the company takes more time to figure out a design that is environmentally friendly and suited to the organization. Mercury News reports (via Venture Beat) that Google’s original objective of occupying its Bay View complex by 2015 is running between 6-12 months behind schedule. The new campus is expected to accommodate 3,500-5,000 staff across 1 million square feet of office space, as Google manages its ever-growing workforce while maintaining a presence in Mountain View. We want to make our Bay View campus a terrific and environmentally sustainable place for Googlers to work. To make sure we get it right, we’re being thoughtful in our design process. Mountain View City Manager Dan Rich said he was “a little surprised” by the delay, however it is not being taken as a sign that Google is backtracking since the company “want[s] to get it right”. Rich further explained that Google is specifically looking at how the campus will be designed, and the appearance of its buildings and exterior elements. 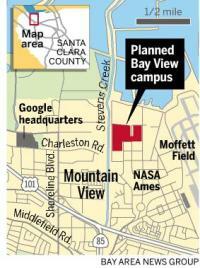 The site itself is owned by NASA and is situated close to Google’s main headquarters in Mountain View — a plan to construct a bridge to connect the two have drawn controversy among the local community. The Internet giant signed a $146 million deal to lease the 42.2 acre space back in 2008 and has plans to continue to continue developing once it has moved in. The company originally estimated construction would start in September 2013. That’s the first of a three-phased approach that would see it extend the office space and R&D labs on the premises in 2018 and 2022. The original plan also included company housing as well as dining, sports, fitness, childcare, and conference facilities. The attention to detail is perhaps more understandable when we consider that this will be the first location that Google has designed from the ground upwards. Perhaps it is feeling the need to review its efforts given the development of Apple’s blueprint for its ‘Spaceship’ campus — a project that Steve Jobs was involved with — which the firm says is on track for completion in the summer of 2016.